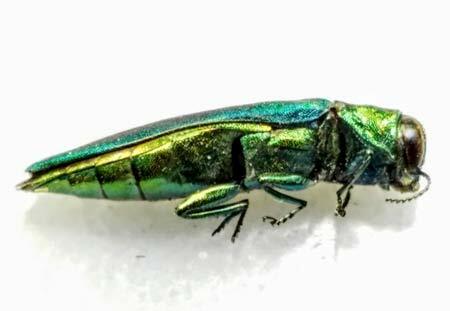 Emerald ash borer is a non-native insect pest that has killed millions of our native ash trees since 2002. It is important to note that emerald ash borer is a newly introduced pest to the region. Having destroyed that many trees in such a short period is remarkable! After some quarantine efforts from the government, it is now running loose in our ecosystem. With no predators around, they are reeking major havoc. First sightings of them were in Northeastern Michigan in 2002. Most likely they came overseas from Asia on infected wooden pallets. Consequently the movement of firewood helped spread the insect out of quarantined areas. Sometime during 2003 E.A.B. was identified in Ohio. Check out what areas are effected in Ohio. Now this invasive insect pest is here to stay. Approximately one in ten trees in Ohio are ash trees. There were approximately 3.8 billion white ash trees in Ohio forests during the initial spread of this detrimental pest. The emerald ash borer may kill a great deal of these. As a result our ecosystems will take a turn for the worse. It was once estimated that nearly 1/4 of the trees in Ohio forests are ash trees. It is important to note that E.A.B. only effect ash trees- of the Fraxinus Genera. Mountain ash trees of the Genera Sorbus are unaffected. Control for the residential or the commercial customer can become costly. Annual preventative treatments are suggested yet are not always effective. Research has proven that trees with more than 40% crown die back do not benefit from treatment. 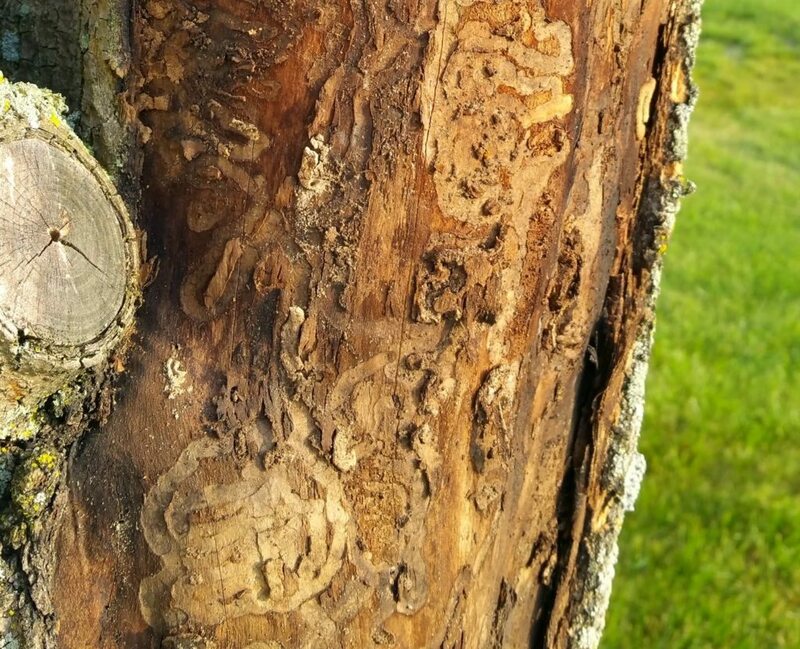 If your tree is suffering from Emerald Ash Borer, there is not a whole lot that can be done. Soil drenches with Merit Insecticide may help keep your tree alive or keep your tree from becoming infested. Keep in mind that there are a lot of White Ash, Fraxinus americana, in Cleveland, OH. These are large trees that can be expensive to cut down. Green Ash, Fraxinus pennsylvanica, is also effected. this is a smaller tree for the most part and not as common. Crown die back followed by more die back in the main branches. Notable “D” shaped exit holes that the insect leaves when it emerges from the tree as an adult. Split and vertically peeling bark. Woodpecker damage is also common on infected trees. Epicormic Sprouting is when the stressed tree will sprout growth from unaffected areas. This is usually below where the larvae are feeding at the base of branches, or along the trunk. You can also peel back the bark layer to reveal the larval galleries. These serpentine galleries are tightly packed with a mix of sawdust and excrement, called frass.